On the trail or on the water, the waterproof UST See-Me 1.0 Steady-On LED Light ensures you can be quickly located in an emergency. 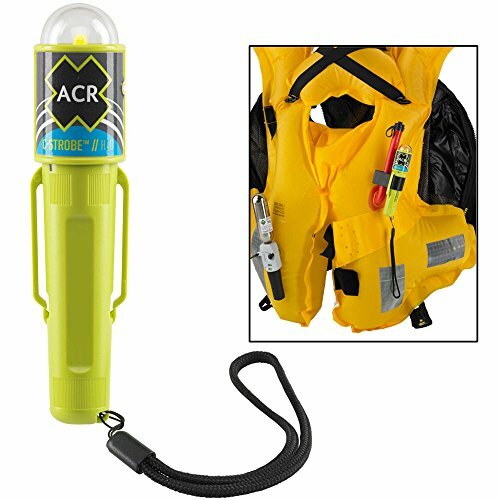 An ideal personal locator light, it's visible for up to 3.4 miles (5.5 km) on a dark, clear night and is great for backpacks, boats, personal floatation devices (PFDs), and more. Approved by the US Coast Guard (USCG), it provides 20 lumens of 360-degree light, and runs for up to 17 continuous hours on 2 AAA alkaline batteries (not included). It exceeds the USCG visibility requirement of 1 nautical mile of visibility (1.9 km). The lifetime LED bulb never needs to be replaced. The See-Me 1.0 Light has an IPX7 waterproof rating, protecting it against water immersion for 30 minutes at a 1-meter depth. It features easy twist on/off control and it comes with a lanyard cord and hook-and-loop strap. The light measures 4.95 x 1 inches (126 x 25 mm) and weighs 1.8 ounces (51 grams) with batteries. It's backed by a manufacturer's limited lifetime warranty. UST Brands has been manufacturing camping, survival, personal safety, and emergency preparedness equipment for over 80 years, including innovative LED lights, all-weather fire starters, premium outdoor cutting tools, camp kitchen products, first aid kits, unbreakable signal mirrors, and more. 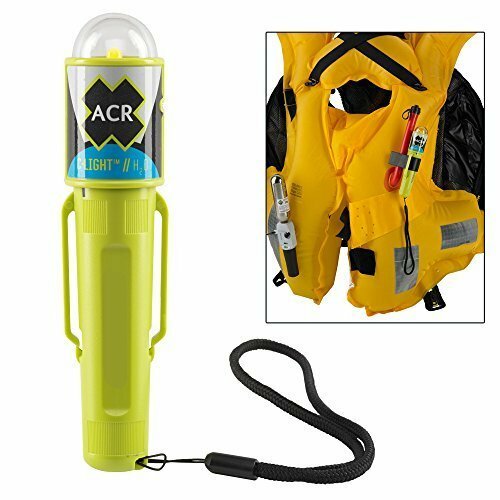 C-LightTM H20 - Water Activated LED PFD Vest Light w/Clip . 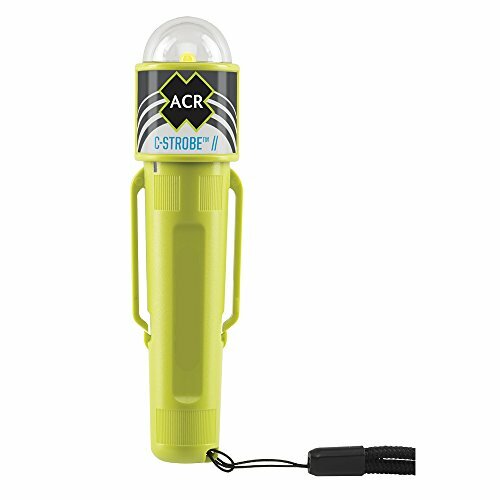 The water activated C-Light from ACR is a feature rich personal .distress light that combines intense LED technology with increased .operating life to provide you with the ultimate steady-on distress light. The C-Light is USCG/SOLAS approved and features an impact resistant case .- making it a reliable, multi-purpose light whenever efficient distress .lighting is needed. Specifications: .Size: 5.56" x 1.38" x 1.2" (14.1 x 3.5 x 3.0cm) . Weight: 1.4oz (40g) without batteries . Operational Life: >30 hr at 30°C (>20 hr at -1°C) . Operation: Manual On/Off button or Water Activation . Activation Method: Water or Manual Activation . Waterproof: Tested for 24 hrs @ 3.3 ft (1m) . Lamp: 20 Lumen White LED . Light Type: Steady On . Battery: 2 AA batteries (sold separately) . Certification USCG/SOLAS, CE, Transport Canada . Reverse Battery Protection: Yes . Accessories: PFD Clip, Lanyard, Velcro Strap . Limited Warranty: 1 year . The PFD Signal Kit 2.0 includes three of our most popular signaling devices. 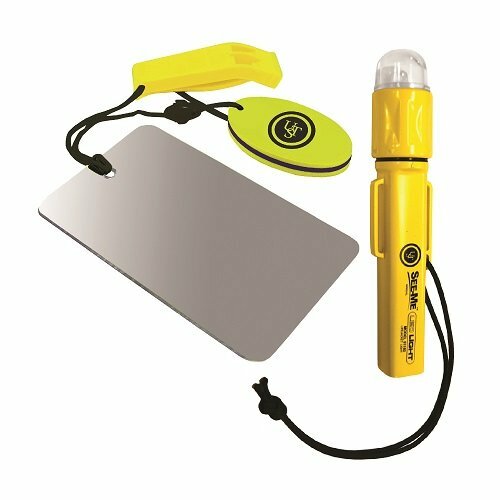 The See Me 1.0 Strobe LED light, Hear-Me marine pealess whistle and our Find-Me signal mirror. 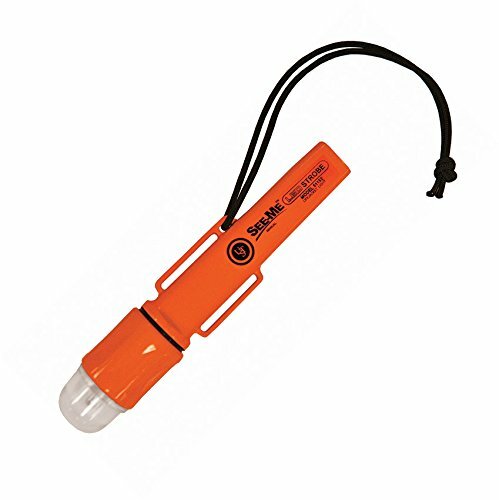 USCG approved See-Me 1.0 strobe light can be seen for up to 2.7 miles, flashes at a rate of 60 times per minute and runs continuously for 44 hours on just one set of 2 AAA batteries. The Hear-Me whistle emits a shrill high-pitched sound and includes a breakaway lanyard. The Find-Me signal mirror is virtually unbreakable and is a must-have for any survival kit. 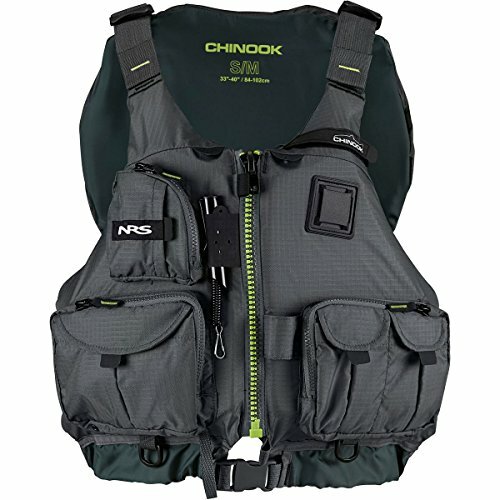 NRS Chinook Fishing Lifejacket - The NRS Chinook Fishing Lifejacket by NRS is more than a safety aid, it's gear that makes you more effective on the water. Designed with anglers in mind, the Chinook features 7 front pockets for everything from small tackle boxes to tippet, perfect for kayak fishing, fly fishing and extended tours! The mesh lower back is a great fit on high-back seats and provides ventilation when the weather's warm. The roomy front-entry design with 8 adjustment points lets you customize the fit for comfort and security. Soft PlushFIT foam flotation conforms to your body as you wear it for unsurpassed comfort. A coil tool retractor allows you to clip on line snips, forceps or other tools that you want to have handy. It includes a D-ring on the back for attaching your net, plus a strobe holder loop for those low light conditions. Other outstanding features include rod holder loops, a knife lash tab, and multiple D-rings and attachment loops. Pockets on pockets, lots of gear attachment points, plus flotation if you swim -- what's not to like about the NRS Chinook Life Jacket? Kayak anglers attest, no other fishing live jacket can match the comfort and utility the NRS Chinook Fishing Lifejacket delivers. 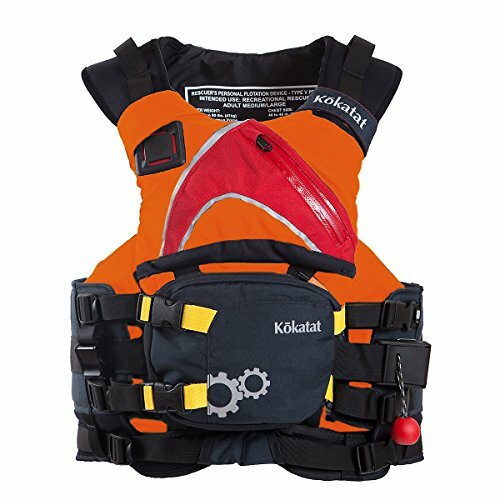 Kokatat Maximus Centurion Rescue PFD - The Maximus Centurion Rescue PFD by Kokatat is a bold new vest full of innovations and features for whitewater kayakers and sea kayakers alike. Made of environmentally friendly Gaia PVC-free foam encased in a 500 denier Cordura outer shell, The Centurion is made for extra durability. Designed and manufactured to the exacting standards set by the US Coast Guard, Transport Canada, and the European Union, this low profile vest features Kokatat's Dynamic Suspension System (DSS). Wide, contoured neoprene shoulder straps allow unrestricted movement of the front flotation panels so they move freely with you. Webbing adjustments placed on the front of the vest, make it very easy to dial in the comfort. The Maximus Centurion features a large, gusseted duplex front pocket, several attachment points for accessories like a knife or strobe, and the strength required for swift water rescue. It also comes with a quick release chest harness and O-ring, a Belly Pocket accessory, as well as a stretch mesh sleeve for your cowtail or tow tether (not included). If you are looking for the most comfortable rescue PFD money can buy, the Kokatat Maximus Centurion Rescue PFD will put your mind at ease. The Firefly Pro emergency strobe light from SkippersMate boats an all-new light output power management system that produces over 41 candela of light per strobe for up to 56 hours. Three functions... Ultra bright Strobe, SOS and Steady On. Buy online, in stock and free postage. 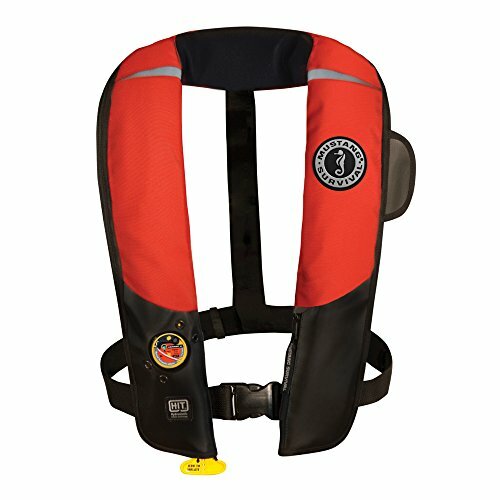 Compare prices on Pfd Strobe at ShoppinGent.com – use promo codes and coupons for best offers and deals. Start smart buying with ShoppinGent.com right now and choose your golden price on every purchase.